Quickly escalating in popularity, wrought iron stair railings are an elegant trend for interior spaces. While traditional metal baluster systems are an excellent choice and more cost-effective, hand forged wrought iron offers an upgraded look with a luxury feel. 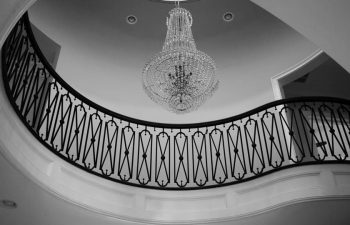 For clients seeking a unique handrail system in a new residential home or commercial building, different from simple metal or classic wood balusters, wrought iron is functional yet beautiful. 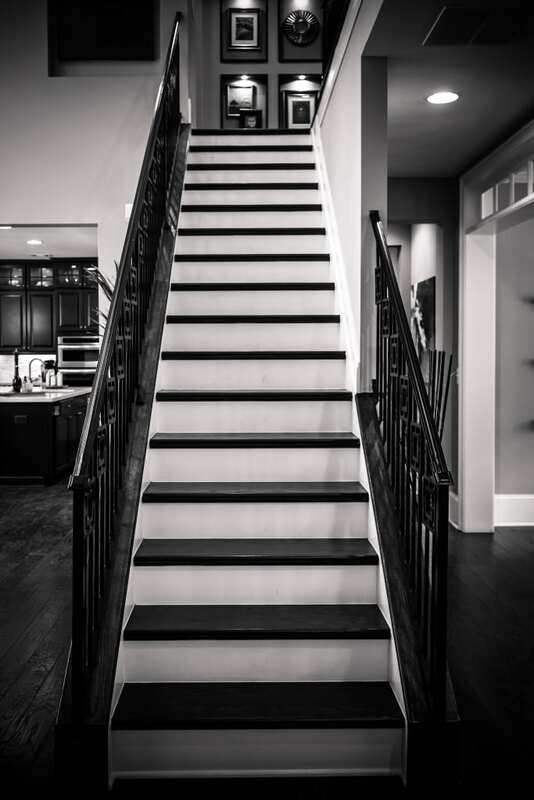 It pairs nicely with both dual and mono stringer configurations, a perfect option for setting custom stairs apart. Why choose wrought iron stair railings over a metal baluster system? While simple metal balusters have their own appeal, they lack the luxurious customization options that a wrought iron handrail offers. The malleable metal leads to a strong, durable construction, beautifully hand forged in many different shapes and designs. With limitless style options, the decorative metal is crafted in our own facility by our team of artisan welders. Our creative, talented team creates wrought iron handrails of all styles: from clean geometrical designs to elaborate scroll patterns, and everything in between. Whether you have your own inspiration or want to browse patterns in our ornamental metal catalog, our team has the capability to bring your vision to life. What do wrought iron stair railings have that metal balusters do not? Many clients who seek a unique handrail system look for the traditional choice, in wood to metal designs. When weighing options for metal handrail systems, there are several key considerations. While there are various baluster patterns using simple metal bars, your options are somewhat limited. You are working with vertically-installed, clean, parallel bars. Wrought iron, on the other hand, offers vast customization options. Hand forged for a custom, avant-garde feel, wrought iron can be created in horizontal patterns and even custom curves. The systems can incorporate both paneled and single baluster arrangements. To enhance the system and ensure a seamless look, the entire balustrade is powder coated for a clean, high quality, extremely durable finish. More on wrought iron stair railings. With a beautiful finish and custom design, each wrought iron handrail system is a work of art. We consider ornamental metal systems a fun spin on traditional products in new construction, and our creative design team and craftsmen enjoy the challenge of breaking the mold, delivering unique products to each client. Visit our wrought iron stair railings product gallery for additional details and pictures on our exquisite projects. From inspiration to installation our team is committed to designing and building the highest quality custom staircases. Our reputation speaks for itself and client satisfaction is our highest priority. 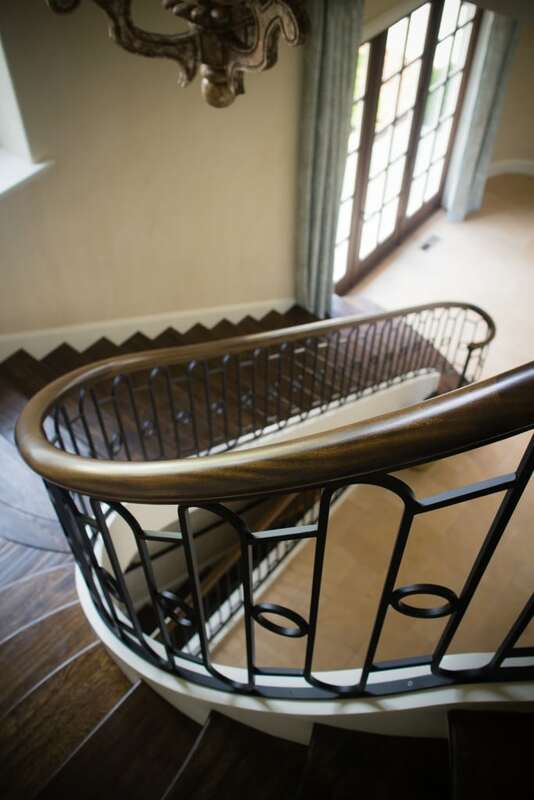 Contact us today to discuss your next wrought iron stair railings project in your new residential or commercial space.